Already at that time they were much sought-after. No curiosities, but rare and mostly particular exemplars. This is addressed to post cards. Post cards in a quadric-lingual pre-printed form in Norwegian, German, English and French. The motive was continuously changed. It was intended that they all were to have one in common: a mostly long passage on the Fram through Polhavet – the famous polar sea. But, was it really the reality? By starting the investigation more and more doubts are arising. The official stamp mark of the Fram which was used to devalue the postage stamp often shows dates from 1918 till 1924. Was it really possible to ferry these post cards with the Fram as indicated on this form? 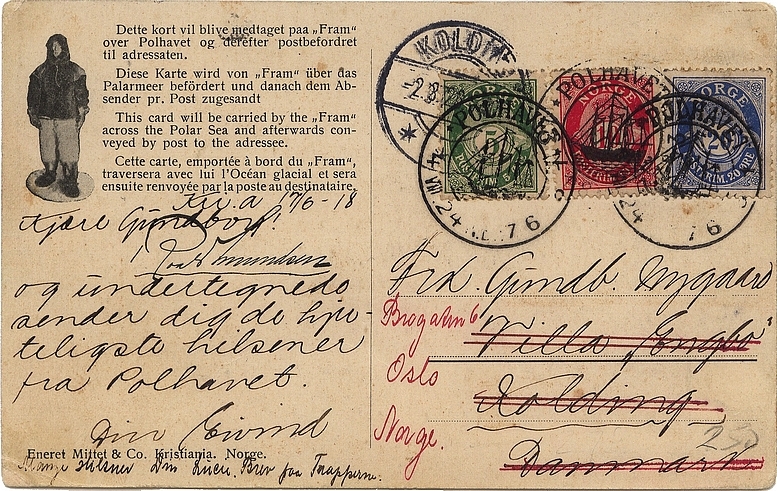 ‘This post card is ferried by the ‘Fram’ through the polar sea and afterwards forwarded by post to the addressee’, so the official statement reads on the concerned cards. The longer one is concentrating on these post cards, the more questions are posed. Why do these cards exist? Which function, which intention did they have? Have they ever been on board of a ship in the polar sea? And if yes, on exactly which ship and for which purpose have they ever been? All legends and explanations lead to one name: Roald Engelbregt Gravning Amundsen. 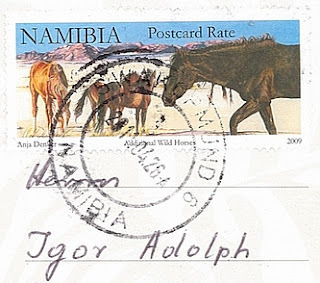 The Norwegian explorer, one of the capacious and significant of all time has dealt much more with post cards than perhaps is expected. Without him these cards never would have been existed! The history of the post cards is linked up with the history of Amundsen. The truth about post cards is echoed in Amundsen’s wishes, in his cleverness, in his overwhelming will as well as in his target-oriented ideas. Roald Amundsen himself aimed very high, he was nearly hung up on getting deathless reputation and fame. Because neither he nor his family was well-heeled he unavoidable had to take innovative lines for being able to finance his many expeditions and projects. Eventually Amundsen was somewhat ahead of the times. He took a very great risk, and he dabbled impulsively in always new ideas. The explorer Roald Engelbregt Gravning Amundsen went to such lengths that he lied to the world around himself. Indeed the explanations about the post cards can only be detected by the knowledge of Amundsen’s narrative, but this is not the only one element. His expeditions are of very high relevance. Started from the Belgica-expedition to the South Pole, followed by passing through the North-West passage and the world-famous racing duel to the South Pole with Robert Falcon Scott to the point of the northeast passage. Not only his expedition themselves, but also the method of sourcing played a major role. Also keeping in mind his ships he explicit mobilized for his expeditions – the Gjoa and particularly the Fram and the Maud. Just if all puzzle particles can be connected it will be possible to find out and to understand the real truth about the post cards. But unfortunately the puzzle is not as simple as it seems at first view. It needs a profound research, a studying of many different origins as well as the discovering of the genuine truth. Amundsen’s history is full of contrarieties and mysterious elements. He always preferred to assure himself the exclusive right about any reports about his expeditions. His crewmembers had to sign up contracts by which they were enjoined from doing this. No more than years later, after the death of Amundsen, some of them published their own version of the incidents. Often being contradictory Amundsen’s reports. There was also nebulosity about the health status of Amundsen – he by himself always denied been taken ill, his companions argue converse. 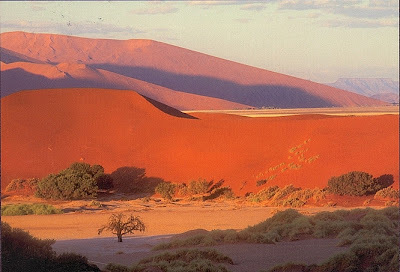 In the next chapters further information will be found for clarification the truly issue about the funding of the respective expeditions and they will be additionally lighted up. Furthermore the history of the Fram and Maud as well as the history of Amundsen himself will bring together the complete establishment of the truth.